The image above is captured at hip height. While it’s beautiful conditions and an amazing scene, there’s a lot going on in the foreground and we don’t have any strong leading lines and instead, it appears quite messy. In the image below I’ve used a much lower perspective and moved closer to the formations in the sand. 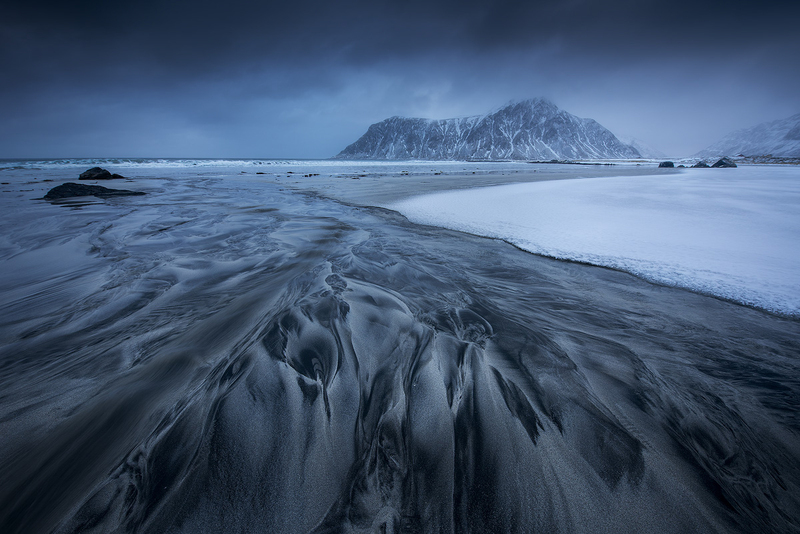 While the conditions that day were quite different, you can see how the sand now serves as an interesting and important part of the image and provides strong leading lines that guide us to the mountain. By using a low perspective you can make even small features in the landscape stand out and become an important part of the image. I often explore various perspectives before mounting the camera to the tripod in order to find the most interesting option. Be aware that moving closer to the foreground affects the focus and choice of aperture. Focus Stacking is a common workaround for this type of images. If you’ve ever photographed mountains with an ultra wide-angle lens, you know that even large mountains become less impressive and may even look tiny in the composition. This is the result of the mountains being further away and since our field of view is so great, they tend to look much smaller than what they really are.